Mary is eight years old and she lives in a small town in Australia. She has a birthmark on her forehead, an alcoholic shoplifter for a mother, a pet rooster and a fondness for sweetened condensed milk. Max is a 44 year-old obese Jewish man living in New York. He has some pets (one cat, one parrot and a series of unlucky goldfish), his favourite food is a chocolate hotdog and he has Asperger's Syndrome. They seem the most unlikely companions, but as they strike up an epistolary relationship that lasts for twenty years, we soon learn that they actually share a great deal in common. They are both lonely and sad, and in a world that can often be confusing and cruel, they only have each other. This unusual friendship is the heart and soul of Mary and Max, Adam Elliot's weird, funny and affecting animated oddity. 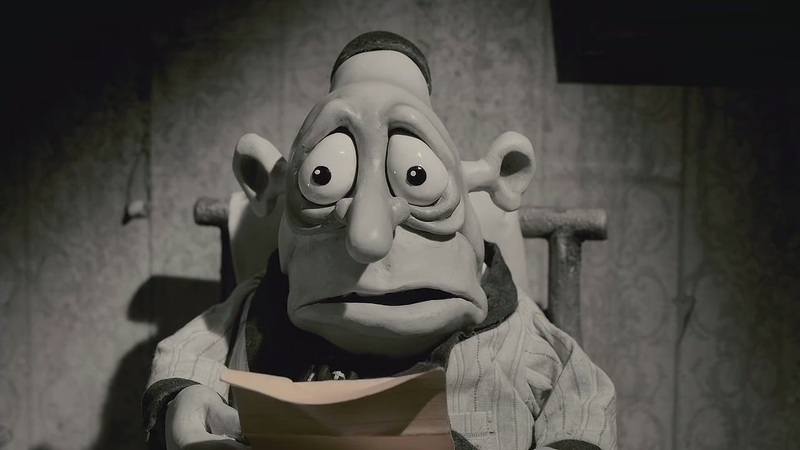 This is a film produced by the painstaking process of stop-motion, and when you consider how lengthy and laborious this approach is, there's something truly wondrous about the pin-sharp comic timing, the perfectly judged manipulation of tone and the depth of feeling that Mary and Max possesses. Elliot won an Oscar in 2004 for his animated short Harvie Krumpet, and that film gives you an idea of what to expect in his feature debut. The director is unafraid to mix an exaggerated animation style with a story that deals with loneliness, disability and death, and he daringly blends surreal comic touches and imaginative interludes with moments of genuine pain and despair, rarely putting a foot wrong in the process. Elliot's unique visual sense instantly creates a memorable world for his characters to inhabit. Australia is painted almost entirely in a variety of brown hues – even Mary's eyes are described as "the colour of muddy puddles" – while New York is portrayed in a grim and intimidating monochrome. As Mary and Max send gifts to each other through the post, they bring a little of their own shading into the other's environment, with the red pom-pom supplied by Mary becoming a vibrant presence in Max's world, sitting atop his yarmulke. There's a wonderful attention to detail in the film's production design, and every frame is filled with neat effects and clever little gags. Elliot incorporates some amusing running jokes into the narrative, like the presence of Max's imaginary friend Mr Ravioli, who just sits in the corner reading self-help books, or the frequent occurrence of unusual and often incorrect facts (it has some inventive answers to the question of where babies come from). However, Mary and Max is ultimately a character-driven film, and in its central figures, Elliot has created two of the most memorable and lovable film characters of the year. In particular, Max is a wonderful piece of characterisation. He is played by Philip Seymour Hoffman, whose towering vocal performance is so good I had no idea it was him until his name appeared in the end credits. He absolutely nails Max's gruff, New York tone, and fills his voice with the melancholy sense of a man who simply doesn't understand the world he lives in. Elliot walks a remarkably fine line between drawing laughs from Max's Asperger's – his inability to recognise expressions and his literal-mindedness is the root of many funny scenes – and dealing with the reality of his condition in a sensitive manner. For her part, Mary evolves over the course of the film, beginning as a picture of innocence and curiosity, before unwisely losing sight of what's important in her life and then turning her life around after hitting rock bottom. She is voiced as a youngster by Bethany Whitmore and then by Toni Collette, who does a superb job of charting Mary's fluctuating emotions, while the target of Mary's affections – the stuttering Damien Popodopolous – is played perfectly well by an underused Eric Bana. Mary and Max is narrated by Barry Humphries, whose voiceover has a measured and lyrical air, and the film as a whole is a triumph of storytelling. Elliot delivers complex, flawed and entirely empathetic characters and paces his narrative with complete confidence as he charts the back-and-forth between Mary and Max, the moments of connection, anger and heartbreak that they share. This is as touching and convincing a portrait of friendship as I have seen in a film for some time, and in its climactic scenes it delivers a huge emotional impact. Mary and Max has taken a long time to reach UK cinemas – I first saw it over a year ago – but now that it has arrived on these shores I can finally recommend it unreservedly. It's a beautiful, imaginative and deeply moving achievement, and undoubtedly one of the finest films of the year.